Of the four Christian communities in Nailsworth the Anglican Church may seem to have the least interesting history. The town has only been a distinct ecclesiastical parish since 1895 and its Grade II parish church is even more recent. The Society of Friends can boast of roots dating back to the mid seventeenth century and Christchurch not only has early Independent roots but its Baptist tradition claims descent from one of the largest rural Baptist meetings in the country. The Former Dominican Priory, just outside the parish boundary, was one of the most influential centres for nineteenth century Roman Catholicism in England. Nailsworth has since mediaeval times been associated with wool and the textile industry for one of the derivations for the Saxon name for the area ‘Naeglesleag Minor’, is ‘wool pasture’, ‘Naegle’ being the Saxon word for a weight of wool and ‘leag’ for a pasture or wood (1). Naeglesleag Minor is recorded in the early eighth century document in which a piece of land was granted by Ethelbald, King of the Southern English, to Wilfred of Worcester, the then diocesan bishop (2). By the time of the Norman conquest the area was held by Godda, Countess of Bologna, the sister of King Edward the Confessor. By the twelfth century the name of the hamlet had evolved into ‘Nailleswurd’ or ‘wool market’ (3). Until relatively recent times we must imagine the area as sparsely populated, thickly wooded valleys. The present town centre, Forest Green and Inchbrook lay within the Parish of Avening; Shortwood, Rockness, Newmarket, Chestnut Hill and Brewery Lane were parts of Horsley whilst Watledge and Scar Hill were situated in Michinhampton parish. The present Church Street lies on the boundary of the ancient parishes of Avening and Horsley. The parish of Avening was apparently attached in some way to the parish of Horsley before 1105 when the independence of each was confirmed (4). In 1082 the manors of Minchinhampton and Avening were given by William the Conqueror to a convent at Caen in Normandy (5). The manor of Horsley was granted to the Abbey at Troarn by Roger de Montgomery, Earl of Shrewsbury, before the year 1086, and a group of Benedictine monks probably settled in Horsley. The original grant was said to provide for a prior, a monk and a parish chaplain who was to reside in Horsley. From these provisions emerged a cell known as Horsley Priory (6). Besides the monks at Horsley there was also a religious foundation at Kinley, in the valley between Newmarket and Nympsfield. An ancient priory or ‘free chapel’ and later chantry chapel, situated here, continued in existence from before 1279 through to its dissolution in 1546. Its final incumbent was James Rathbone, who was presented to the living by Sir Edward Tame of Fairford in 1543. Bannut Tree Cottage, situated in the grounds of Bannut Tree House, in Tabram’s Pitch, has been described by David Verey as, ‘perhaps the most interesting and certainly the most peculiar house in Nailsworth’. One of the earliest references to this building is given by the county historian, Rudder, who, writing in 1779, stated that there was formerly a chapel at Nailsworth and another at Aston, both within the ancient parish of Avening. Seven years later Bigland added these further details – ‘the elliptical arch of a window is there shown in a ruinous building, which is reputed to have been a chapel for the service of the populous district’. ‘N.B. At a small distance north east of the present chapel is the shell of an ancient one, now used as a stable, in the occupation of Mr Blackwell, in which, may be seen, the frame of the east window, a piscina, and an entrance of rude workmanship in the Gothic style. The arch of the window is of the broad lancet kind, 14th century’ (8). Sadly there would appear to be no mediaeval references extant to a chapel-of-ease at Nailsworth so we do not know why and by whom it was built, when it was erected, or even when it ceased to be a place of worship. During the fourteenth century Lower Nailsworth would have been a sparsely populated hamlet under the spiritual care of the Rector of the Parish Church of the Holy Rood or Holy Cross at Avening. There is a tradition that the north-east wing of the neighbouring Bannut Tree House may have been a priest’s dwelling, however, the priest may well have supplied from Avening. The wing of Bannut Tree House is certainly old and contained a circular stone staircase before it was removed in about 1875. A number of interesting items came to light when the former chapel was re-constructed during the late 1830s. A silver penny, dated 1253, was found on the premises, a small metal image of a female ‘supposed to represent the Virgin Mary’ and also a piece of Roman pan or dish ‘similar to that discovered with the tessellated pavement at Woodchester – May 15th 1834’. The location of these artefacts is not now known. (10). In 1260 the manor of Horsley passed to the Priory of Bruton in Somerset and the monastic cell ceased to exist in about 1380. In 1414 the manors of Minchinhampton and Avening passed to the Bridgetine Abbey of St Saviour at Syon. The manors remained in the hands of the respective religious communities until the time of the Dissolution of the Monasteries. Nailsworth was itself an estate held from Avening and it was later a manor in its own right (12). Nailsworth owes its development almost entirely to the woollen cloth industry; the steep wooded hillsides offered little scope for agricultural settlement. The earliest evidence that has been found for the cloth industry at Nailsworth dates from 1448 when John the cardmaker was the leasee of meadow land. Two clothiers, ten weavers, and thirteen tanners were recorded in the part of Nailsworth that lay in Avening parish during the year 1608. Many of the clothworkers whose names were listed under Horsley parish, in that year, were probably actually residing in the Nailsworth area. At that time, in the Nailsworth part of Avening parish, agricultural activity seems to have been represented by only one single husbandman, namely Robert Tanner (1). During the years following the Reformation this sparsely populated isolated community had no immediate Established place-of-worship and the cottagers engaged in the cloth industry quickly became involved in the sometimes bitter conflicts which arose out of religious dissent. There would seem to be no Roman Catholic recusancy in this area. In 1655 a Quaker, Humphrey Smith, preached to a group of Seekers at Shortwood (2) and this led to the formation of a local meeting of the Society of Friends, sufficiently large to warrant visits by their founder, George Fox, in the years 1660, 1669 and 1678. ‘There it was noised all over the county by the Presbyterians that George Fox was turned a Presbyterian. And they prepared him a pulpit and set it in a yard, and there would be a thousand people they said that would come to hear him, the next day being the first day… We came further where the Friends’ meeting place was and there we stayed all night and there was the same report also. And we came by the yard where we saw the pulpit erected. And on the next day, being First day, there was a very large meeting of many hundreds of people and the Lord’s power and presence was amongst us. And there was one John Fox, a Presbyterian, whose name they gave as George Fox. I was; and I turned to the grace of God which would teach them and bring their salvation. And so people generally saw and were ashamed of the forgery of the Presbyterians and the Lord’s power and truth came over all’ (3). ‘supplying of the necessitities of our deare friends who are prisoners for the blessed truth, and the discharge of their room rent in ye prison’ (4). In 1688 a chapel was built on the green by various families. The trustees included Thomas Stephens, a maltster, and Thomas Small, a clothier of Nailsworth. Thomas Woden was the first minister and in 1735 there were 150 presbyterians dwelling within Avening and Horsley parishes (6). ‘After long patience in 1714 a piece of ground was purchased, and in the following year a chapel was built, and all claims were met. The building was, however, a mere shell, without ceiling, gallery, pews or pulpit’ (8). Initially there were only thirteen persons but by 1735 the number in Horsley Parish alone had grown to three hundred. During the ministry of William Winterbotham (1804-29) Shortwood Baptist Meeting was said to be the largest country Baptist meeting in England (9). By then end of the eighteenth century there were three sects dominating religious life in the area and they largely managed to resist the preaching of John Wesley (1739) and George Whitfield (1743) on Minchinhampton Common and the later activities of the Methodists. A society at Well Hill, Minchinhampton, met considerable opposition from amongst local people and a riotous mob attacked a house used for meetings (10). Thomas Adams, who had formed the group at Well Hill, later built and endowed the Rodborough Tabernacle for Calvinistic Methodist worship. The nearby Littleworth Methodist Church was erected in 1790. The Established Church would have played a relatively insignificant role in the Nailsworth area at this time and adherents would either have had to walk over two miles to their parish churches or to worship in the various nonconformist chapels that have been mentioned. The graveyard at Forest Green has many local Anglican families buried there (11). ‘At the time of the erection of Nailsworth Chapel, when a sardian deafness had come upon the Church of England, and when its bishops were as much asleep as were its clergy, it was the lot of Avening to be scourged with a rector who cared more for the endowments of the benefice than for the souls of the people committed to his charge… Though leaving the Nailsworth end of his parish to take care of itself, yet he had sufficient zeal and cunning to try to grasp at the control of the pious works of others, and to thwart them if not performed exactly to his mind’ (2). ‘a gentleman well known for his intimate acquaintance with most of the nations of Europe, which he repeatedly visited as well as the greatest part of England. In mineralogy, of which he has a most judiciously-selected cabinet, he possesses a great information, as well as in ancient and modern languages and general knowledge of a liberal and elegant kind. All which he enlivens by ability, vivacity and wit’ (3). ‘Whereas the inhabitants of Nailsworth are almost deprived of the benefit of attending Divine Worship according to the Establishment owing to the distance from, and the bad roads to, the surrounding churches. Nailsworth is a very populous village situated in the parishes of Avening and Horsley, and inhabited chiefly by people employed in different branches of the clothing manufacture – most of them with large families – consequently rendered so poor that it is entirely out of their power (of themselves) to raise a sum sufficient for the erecting of a small chapel. Two or three of the principal people residing in the said village have suggested a plan for entering into a subscription and soliciting the assistance of those who are willing to encourage such an undertaking, that the labouring poor of the aforesaid place may have an opportunity of attending the Church on the Sabbath day’ (4). Dr Pavey-Smith, in his booklet ‘Nailsworth 1500-1900’, suggested that the major reason for building a chapel was as an attempt by the mill owners to stabilize the labouring classes who were being influenced by the spreading discontent sparked-off by the French Revolution of 1789 (5). Mrs Betty Mills, in her ‘Portrait of Nailsworth’ proposes that the building of the factory mills by speculative mill owners, who were not of local non-conformist stock and had moved into the area, were responsible for building an Anglican church as they feared the strength of the chapels where traditionally mill owners and workers worshipped side by side (6). During this period Nailsworth was certainly expanding and at times the cloth industry thrived with improved communications and the new factory mills. Certainly for some of the inhabitants a church-building was becoming increasingly desirable. Be and are hereby appointed chapelwardens during life but when the number is reduced to seven the said number of named shall be filled up by the choice of the majority of the survivors. Resolved that the said committee many those of whom shall be empowered to receive the subscriptions and purchase land and attend to the erection of the chapel and seats and other necessary buildings and conduct all payments and disbursements and shall choose a Treasurer and Secretary and when the buildings are completed and the purchase money for the land paid the overplus of the subscription shall be paid to the chapelwardens or the survivors of them to be placed out at interest for the benefit of the clergyman who shall from time to time officiate and perform divine service in the chapel intended to be erected. Resolved that the majority of the said chapelwardens and their successors and the majority of the survivors of them shall in twenty days after notice given them by the committee that the chapel is completed nominate four clergymen of the Established Church of England one of which shall be chosen and appointed within twenty days after such nominated by the Incumbent of the Parish of Avening, for the time being the care of the said chapel who shall every Sunday morning and evening at such hours as the majority of the chapelwardens shall appoint do and perform divine service according to the rites of the said Established Church in the said intended chapel and whenever a vacancy shall happen in the care of the said intended chapel the majority of the chapelwardens for the time being of the parish of Avening shall choose and appoint within twenty days in the manner before mentioned and in the case of the Incumbent of Avening for the time being or the Bishop of the Diocese of Gloucester shall within the span aforesaid neglect or refuse to appoint one of them the said chapelwardens shall appoint one of the said clergymen so nominated as aforementioned. Resolved that the seats or pews which from time to time be erected in the said intended chapel shall be costed in the chapelwardens’ accounts for the time being and shall be let and sold by them or the majority of them from time to time and the rents and profits thereof be applied for the use and benefit of the curate for the time being, unless the majority of the chapelwardens shall think necessary to apply part thereof for and towards the repair of the said chapel and pews such part not to exceed one fourth of the net annual rents of the seats or pews. Provided that in case the present Bishop of Gloucester or any future Bishop of the said diocese shall attempt or present any clergyman or clergymen to the care of the said intended chapel contrary to the manner hereinbefore directed to be placed out at interest for the benefit of the curate for the time being shall be deposed of by the majority of the chapelwardens for the time being for such charitable purposes as they shall think proper. On 25th January 1803, when the Trust Deed was signed, there were several amendments. A clause was added instructing the chapelwardens to go on selecting four clergymen until the Bishop eventually licenced one. If the Rector refused after forty days to appoint one, the chapelwardens, of whom there should never be less than eight, were to appoint one themselves. The chapelwardens were also empowered to dispose of the land and demolish the chapel. William Playne, Edward Dalton, William Playne, jun., Mr Peter Playne Smith and Edward Wise were signatories (6). ‘It exhibits great tact and considerable shrewdness in dealing with a very difficult case’ … ‘The founders at once perceived that if the chapel was consecrated it would belong to the said Rector, who might serve it in person, or by a curate, and perhaps afford only one service on each Sunday and that at an inconvenient hour. For in 1795 and 1803 the “Church Building Acts” did not exist. To keep the Chapel out of the Rector’s hands, but yet with sufficient politeness to avoid any overt collision, was therefore the delicate object to be secured by the Trust Deed; and this it certainly has achieved. Thus the clause which requires two services on Sundays, and at such hours as the Trustees shall appoint, was designed (it is said) to preclude the interference of the Rector in such a way as to prevent the due performance of Divine service for the convenience of the people. The clause which permits the trustees to control the appointment of any deputy appointed without their consent, would seem to be designed to prevent the intrusion of the Rector or his curate at any time against the wishes of the trustees. The clause respecting the sending of the names of the four clergymen to the Rector is adroitly concocted to avoid any collision with the said Rector which might arise from a direct refusal to sanction the nominee of the trustees. It is said to have been inserted at the suggestion of the conveyance who drew up the deed, who thus made a virtue of necessity, since the Rector would have an undoubted veto under any circumstances on the intrusion of an officiating clergyman into his parish against his wishes. Now the Deed clearly suggests that it is no business of the trustees to ascertain whether all or any of their four nominees would accept the charge, since it contemplates a possible refusal by the Rector’s selected nominee after he has been chosen by the Rector. Hence it is clear that the four names are to be sent merely as a sort of legal fiction; the real nominee of the trustees would be No 1 on the list, and the rest “men of straw” or at least clergymen who were not likely to accept the charge. For the Rector to select any but the first would be virtually to decline the trustees nominee without the unpleasantry of a direct rejection, in which case they would begin anew. Or in the event of any disagreement with the Rector, they could go on ad infinitum, sending in four names every three or six months while the Chapel was being actually served by some one of whom they should approve, or else shut up as circumstances might require. Or yet again, if they should disagree among themselves as to the real nominee they might send the names of one or two or three, or even four bone fide nominees, so as to compromise their own disputes by leaving the Rector to act as umpire between themselves. Should any Rector be dilatory or factious, of course during any vacancy the Trustees would appoint their own Minister to supply the duty. Should any Rector be rash though to stop the service, it is in the power of the trustees to “sell” the Chapel if they please, and to convert it into a Free Church Conventicle or a dissenting Meeting House, or into anything else they please. Thus the Trust Deed was skilfully adapted to meet an urgent case. And the Nailsworth people have every reason to be thankful that the Chapel has been kept clear of any needless connexion with the parish of Avening’ (7). Over £700 was collected by subscription. The chief contributors were Jeremiah and Daniel Day; Nathaniel Dyer, and J.P. Westley, who each gave £50; Joseph and Philip Lock both gave £30 and Sir George Onesiphorus Paul of Hill House, Woodchester, and Lord Ducie of Spring Park (Woodchester Park) who both gave £20 towards the project. The other one hundred and three subscriptions that are listed included smaller sums ranging between ten guineas and half a guinea (8). There was some difficulty over securing the actual site as the land was owned by Jane, the widow of W.C. Sheppard, and she was too elderly and frail to transact the business. The land was not transferred into the hands of the trustees until after she had died and had bequeathed her property to Thomas and Ann Shutz. William Smith actually purchased the land and he was in turn reimbursed by various chapel wardens. Some money was realised by the sale of part of the site. In fact the final figure paid out for this wonderful commanding site was £105. The deeds, which were signed on 25th January 1803, described the purchase as half an acre of land bought from W.C. Sheppard, Thomas Shutz and his wife, Ann Shutz (9). ‘The erection was principally owing to Jeremiah Day Esq, the chief inhabitant, who married the sister of John Remmington Esq. of Horsley’ (10). The building work was commenced in about June 1793 to the design of Nathaniel Dyer, a chapelwarden. It was said that if Nathaniel Dyer, the architect; Thomas Underwood, the blacksmith; and Daniel Browning, the plumber and glazier, had not given their services free, the chapel would never have been built. Already £200 had been mortgaged and this figure rose to £203-11-9d in January 1803. The sum was finally paid off at £25 per annum until the debt was cleared in 1823. The Nailsworth Chapel was built in a fairly restrained classical style and consisted of nave, apsidal chancel, organ and tower. The galleries and vestries were added later (11). The small west tower, with its attractive domical roof, gave the building dignity and this feature gained the chapel its affectionate nickname – ‘The Pepper Pot’. The tower contained a bell cast by John Rudhall in 1795 with a diameter of 25 inches (12). This bell has since been incorporated into the town’s memorial Clock Tower. The Royal coat-of-arms of King George III was hung at the west end of the new chapel and this can now be found in the present St George’s Church. There were 217 sittings in the chapel of which only very few were free. The Reverend Messing Rudkin, the Vicar of Horsley from 1878-1887, wrote in his History of Horsley added that this enthusiastic description by Fosebrooke ‘is too great a demand on our charity’ (13). By then ecclesiastical taste had changed greatly! Nathaniel Dyer, the architect, was born in 1752 (14) and at various times he owned the George Inn at Nailsworth, the Star Inn at Inchbrook (14), as well as running a successful wine merchant’s business. He made his home at Spring Hill House, later known as ‘The Lawn’ and now ‘Winslow House’ in Spring Hill where he designed the Georgian façade of the house together with its stone pillared porch. According to David Verey, the architectural historian, the design of the ceiling of the parish church at Wotton-under-Edge can be attributed to him (16). The design of the Pepper Pot may well have been influenced by two earlier chapels – Wooley and Hardenhuish, one near Bath and the other near Chippenham, both attributed to John Wood the Younger. ‘The annual sum of one guinea to the Minister of Nailsworth Chapel for a sermon on February 6th, ten shillings to the chapelwardens, and the rest to be distributed in bread to the poor of Nailsworth for ever’ (17). The annual sermon was to be preached on his birthday and in the early 1970s the income derived from the charity,£2-10s, was used to help the needy at the vicar’s discretion. Nathaniel Dyer’s memorial plaque, by Cooke of Gloucester, cost £5 and was later transferred to the present parish church in 1900. His grave can still be visited amongst modern houses off Spring Hill. Mrs Betty Mills was given portraits of Nathaniel Dyer and one of his four wives by a woman who claimed to be the sole descendent. Nathaniel Dyer had apparently purchased a manor house and farm near to Bredon, where he often stayed, and, on his death, he left this property to his nephew. The pair of portraits have now been reunited with the Dyer Family at Bredon and only copies hang at Winslow House. ‘Tradition states that the said Rector (of Avening) on coming over with his son to inspect the rising chapel was overheard to say “Let the fools go on and when it is finished it will be mine”’ (18). ‘1794 Oct. 19. – The new Chapel of Nailsworth was opened by Rev. Anthony Keck M.A. who thereupon resigned the curacy of this parish’ (19). Anthony Keck was the son of Anthony Keck of King Stanley. He was educated at Trinity College, Oxford, and matriculated on 11th October 1784 aged eighteen years. He gained his B.A. in 1788 and M.A. in 1791. Keck had been curate of Horsley parish from 1792. He received but a meagre income at Nailsworth, but clearly had private means for he purchased the Castleman estate at Barton End (20). In 1803 he applied for the living of Stonehouse (21) and finally left Nailsworth in 1811 to return to Horsley where he was licenced on 8th June 1812. He acted as curate-in-charge at Horsley until his death in November 1825. From 1774 until 1825 the Vicar of Horsley was the Reverend Richard Davies. He was absent from the parish for much of his incumbency as he had also been elected Vicar of Tetbury (22). During the years 1794-1810 the curate at Horsley was the Reverend Thomas Dudley Fosebrooke M.A., who resided at Rockness where he produced his monumental ‘history of Gloucestershire’. Fosebrooke took an active interest in the welfare of his parishioners and he had over six hundred persons vaccinated at his own expense during 1810 (23). The chapelwardens, or trustees, of the Nailsworth Chapel were all respected local citizens. John Remington and Joseph Lock both owned mills in Horsley parish. Jeremiah Day and his brother, Daniel Day, had operated Day’s Mill from about 1784. Members of the Playne Family were also clothiers in the area operating Longfords Mill and later Dunkirk Mill. The Playnes, who were a Kentish family before settling in the Nailsworth area during the 1750s, purchased the manor of Avening in 1812. These men had achieved their objective of erecting a place of worship in the centre of Nailsworth where local people could celebrate the liturgy of the Established Church. We have little evidence to either support or discredit the Stroud Journal contributor (2) with regard to relations between the chapelwardens and the Rector of Avening. In 1793 his name appears as a committee member otherwise we only have his letter, written in 1803, to the chapelwardens offering the services of his son, Henry, when Anthony Keck applied for the living of Stonehouse (3). On 27th August 1804 the Bishop of Gloucester wrote to Mr Keck praising the chapel and promising to consecrate it during the following summer. The consecration never took place (4). The chapel was not without financial difficulties for the minister’s stipend, which was ‘supported by the profits of the pews’ fell from £75 per annum in 1794 to £40 in 1811. One solution for increasing the chapel’s income was to erect galleries. The chapelwardens – Mr Smith, Mr Lock, Jeremiah Day and Mr Remington all had galleries. However, this matter became divisive when the Reverend Dr Moore had a gallery erected for himself even though he was not one of the original subscribers to the chapel. In 1812 a group of chapelwardens further objected when Nathaniel Dyer not only built a gallery but created an entrance for it, from outside, without consent. He retorted by reminding this fellow wardens that they had already destroyed the proportions of the building with their own constructions (5). In 1815 the financial difficulties became so acute that a public appeal was launched for ‘the case of the Episcopal Church in Nailsworth’. £320 was raised from this initiative which offset the cost of repairs and maintenance to the fabric which had resulted in escalating debts (6). Nor for his hard work. During 1839 two new faces were added to the clock in the Pepper Pot tower by Mr Underwood, the local blacksmith, which improved the clock which had initially been provided in 1805 by public subscription. Two quarter bells were also added at the same time but these were inferior to the bell cast by Rudhall and one of them had cracked by 1951. On the 16th of May 1839 was erected a seat in the garden an old window and other relics from Horsley Church. The seats are oak made from the celebrated pole erected to perpetuate the general peace of 1814 which I sold by auction on the 14th January 1839 in upwards of twenty pieces after been carried being carried through the neighbourhood attended by the Nailsworth Band in their scarlet uniform. ‘The proceeds of the sale amounting to near five pounds with a subscription from persons in the neighbourhood amounting to £25 and upwards to defray the expenses of erecting two extra new dials for the Chapel Clock for the accommodation of the Inhabitants to be completed by the first of July 1839 for £25 by Underwood & Co, Nailsworth (minus to this day £1-8-6 ½ d & all the costs). The seventy-eight foot pole was erected as a thanksgiving for peace at the conclusion of the Napoleonic Wars. The timber came from an oak tree which stood at Shortwood and when the pole was erected at the Cross, in Nailsworth, a dove was placed on the top of it. On 7th January 1814 three oxen were publically roasted and plum pudding was served. The Peace Pole blew down and the timber was sold. Two candlesticks were made with the wood and placed in Horsley Church and Mr A. E. Smith, who will be mentioned later, owned a walking stick which was also cut from the pole. In 1811 the Reverend Thomas Cooke, LL.B. was appointed as minister. He has been difficult to identify but he may be the son of Solomon Cooke, a gentleman of Minchinhampton. This Thomas was at St Mary’s Hall, Oxford, matriculated on 9th November 1784 aged twenty-three-years, and gained his B.C.L. in 1791. However, I have yet to find a date of ordination for him. From 1816 until 1831 the minister was the Reverend Henry Campbell, M.A. He seems to be the son of Henry Campbell of Marylebone and was baptised on 6th December 1774 in St Marylebone Parish Church. He studied at Christ Church Oxford and matriculated on 17th October 1792 aged eighteen years. He gained his M.A. in 1801. There is a reference to him preaching at Blackfriars Church and that he was ‘Perpetual Curate at Bicton, Salop, and Minster of Nailsworth’. In the years 1822 and 1830 he is referred to as living at Dunkirk House, Nailsworth. On 11th February 1846 he died aged seventy-one-years at Cowley, near Uxbridge, and left money to a wide assortment of church charities. During the 1820s a schoolroom and vestry were erected on either side of the chancel, and a clerk’s house was built in the south east corner of the chapel yard. The school room was presumably built to accommodate the Sunday School which was attached to the chapel from 1815 (8). A Sunday School had existed at Forest Green Congregational Chapel from before 1774 and was one of the earliest in the country (9). Much of the old chapelyard surrounding the Pepper Pot was used for allotments. ‘From Avening I came on through Nailsworth, Woodchester, and Rodborough to this place (Stroud). These villages lie on the sides of a narrow and deep valley, with a narrow stream of water running down the middle of it, and this stream turns the wheels of a great many mills and sets of machinery for the making of woollen cloth. The factories begin in Avening, and are scattered all the way down the valley. There are steam engines as well as water power. The Gloucestershire people have no notion of dying with hunger; and it is with great pleasure that I remark that I have seen no woe-worn creature this day. The sub soil here is yellowish ugly stone. The houses are all built with this; and it being ugly the stone is made white by a wash of some sort or other. The land on both sides of the valley, and all down the bottom of it has plenty of trees on it; it is chiefly pasture land so that the green and white colours, and the form and great variety of the ground and the water and altogether make this a very pretty ride… Even the buildings of the factories are not ugly…’ (11). The poverty in the valley reached terrible proportions and between 1838 and 1840 eighty members of the Shortwood Baptist Church emigrated to Adelaide (12). In addition to the Dyer Bread Charity of 1833 Miss Anne Coffin gave £100 for the temporal benefit of the poor attending the Nailsworth Chapel, which was distributed in clothing by her trustees during the years 1835 to 1837 (13). The only other local charity recorded dates from about the year 1730 when £20 was given by a London merchant, Richard Cambridge, to be distributed by the overseers of Nailsworth tything ‘at their discretion… for the time being’ (14). Mr Campbell was succeeded in 1831 by the Reverend John Simon Jenkinson who was born in 1798 and educated at Magdalen College, Oxford. He matriculated in 1822 aged twenty-four and received his B.A. in 1827 and M.A. two years later. In 1830 he married Harriet Caroline Augusta Grey in Bathwick, Somerset. At this point he came to Nailsworth where his daughter Mary was born in about 1832. He was given the Benefice of Sudborne and Orford which he resigned three years later and became incumbent of St Mary in the Castle, Hastings until 1847. We cannot be sure when he left Nailsworth. From 1847 until 1871 he was Vicar of Battersea and Christ Church College, Winchester. He died in 1871. From 1837 until 1842 the Minister at Nailsworth was the Reverend Edward Arnold. He and his wife were both born in Ireland. At the time of the 1841 census they were living at Newmarket, he was aged thirty-five-years and his wife, Eliza, forty. By 1851 they had moved to High Wycombe. In 1840, two years after the nonconformists had established a British School in Northfields Road, a group of Anglican trustees bought the former Gilkes’ Dissenting Academy. The buildings were purchased for £325 from John Ball and the National School began its life (15). ‘Upon Trust to permit the said premises and all buildings thereon erected or to be erected to be forever hereafter appropriated and used as and for school or schools for the education of children and adults or children only of the labouring manufacturing and other poor classes in the village and hamlet of Nailsworth and its vicinity and as a residence for the teacher. Which said school shall always be conducted upon the principles of the Incorporated National Study for promoting the education of the poor in the principle of the Established Church and shall be at all times open to the inspection of the Government Inspector (16). The building consisted of a first floor schoolroom with a teacher’s house underneath. By the year 1847 there was an average attendance of fifty-nine boys and girls rising to seventy-two by 1870 when the income was supplied by pence, church collections and subscriptions. In 1871 it became a school for girls and infants and in 1883 it was re-built for the cost of £660, paid by subscriptions (17). ‘We the undersigned being all the surviving trustees of the Episcopal Chapel at Nailsworth in the Parish of Avening… do hereby agree to surrender and give up to you all our rights of nomination and presentation to the chapel aforesaid in the event of an arrangement being made with the patrons and incumbents of the parishes of Michinhampton, Avening and Horsley for making the said chapel a district church. Two galleries in the said chapel have been erected by private individuals who will expect to have their pews there secured to them on the same terms on which they now have them of the trustees. Up until 1836 the Anglican who lived in the Amberley district would have worshipped at Holy Trinity Church at Minchinhampton or at Rodborough. As this area became more populated the need for a church grew and during the year 1836 the Church of the Holy Trinity was erected at Amberley, in Minchinhampton parish. It owes its existence to the generosity of David Ricardo, the economist, who lived at Gatcombe Park. The building included the church, which was capable of accommodating in excess of 450 persons, two large school rooms and an adjoining parsonage house for the minister. In 1840 an ecclesiastical district was assigned to it formed out of the portion of the parish of Minchinhampton, usually called Littleworth Tything and that portion of the parish of Rodborough which is situated east of the road leading from the Fleece Inn to the Bear Inn. This meant that Nailsworth was now part of four parishes. The first perpetual curate of Amberley was the Reverend R.E. Blackwell, who later became Rector in 1866 when the parish was designated a Rectory under the District Church Tithes Act of 1865. At the beginning of the nineteenth century many new churches were built in England with the great increase and movement of population. The responsibility of providing for the efficiency of the Church was recognised by the state and in the year 1818 the first of the Church Building Acts was passed empowering the Crown to appoint commissioners for building new churches. Under this and other acts, powers were given for the division of ancient parishes in order to form new and separate parishes for Church purposes. The Commission remained in office until 1857 when its functions were transferred to the Ecclesiastical Commissioners. Between 1818 and 1857 twenty-one acts relating to the building of new churches and the constitution of new parishes were passed, many of these statutes being complex and conflicting in character. Under these acts the Church Building Commissioners were empowered to create District or Distinct and Separate parishes; Consolidated Chapelries; and District Chapelries or Particular Districts. District or distinct and separate parishes were formed by the division of existing parishes either with the consent of both the bishop and patrons or, in the case of a District Parish, the bishop only, as the tithes and permanent endowments were not affected. A Consolidated Chapelry was formed out of contigious parts of different parishes or extra-parochial places and the consent of the bishop and the patrons of the several parishes, or the majority of them, was required. The District Chapelries or Particular Districts were districts assigned to a parochial chapel or chapel-of–ease, the latter requiring only the consent of the bishop (20). The case of Nailsworth was initially tackled with proposals for a district to be assigned to the Nailsworth Chapel based on the Nailsworth Tything and perhaps including other areas. Consideration was given to forming a parish but this could only have included the Nailsworth Tything of Avening. The final solution was the creation of a consolidated chapelry but this took sixty-two years to achieve. In 1836 Thomas Richard Brooke was instituted as Rector of the parish of Avening having presented himself. He was a wealthy man and he built a new rectory at Avening and he remained there until 1854 when he retired abroad providing a curate for the parish until 1857 (21). In 1842 the Reverend John Betts, B.A., was appointed as minister of Nailsworth Chapel. He made the condition that he would eventually receive an income of £75 per annum from the Nailsworth Tything instead of the £60 per annum from the pew rents (22). Both Betts and Brooke were deeply committed to assigning a district to the chapel at which time the building would be legally consecrated. Betts had been educated at Queen’s College, Cambridge, and was ordained priest in 1831. He was Curate of Cleeve in Gloucestershire and then at Yatton before moving to Nailsworth. At the time of his appointment to Nailsworth he was aged about thirty-seven-years, married, with a young daughter Annie who had been born in Yatton. The 1851 census reveals that he and his family were living in Shortwood and that he was born in Colchester. ‘This chapel has never been licenced or consecrated, it is in the hands of trustees who are ready to place it in the hands of the Rector of the parish who has already laid the matter before the Ecclesiastical Commissioners with a view to getting a district assigned and the building consecrated…’ (23). Tho’ a stranger I venture to solicit your attention to a case of much difficulty, and which involves momentous interests to the place of which I hold the charge. I learn from a friend well versed in the practical details of such matters, that it is one which if brought before Her Majesty’s Privy Council would receive their attention, and in all probability their efficient help. I am the officiating Minister of Nailsworth, Gloucestershire. The Episcopal Chapel of which was erected more than 50 years ago by the private subscriptions of some members of the Church of England for their own use, there being at that time no church within any reasonable distance. It was vested in trustees; and the Trust Deed stated that out of the Pew rents (then much larger than at present) the stipend of the Minister, the salaries of its minor officers and the repairs of the edifice itself were to be furnished. It has never yet been consecrated nor even licensed. Three years since I accepted the charge of the place at the hands of the present Rector of Avening, under the assurance that within 6 months the Chapel would be consecrated and a portion of the tythe or rent charge belonging to that end of Avening Parish (in which the chapel is situated) should be attached to it by way of endowment. Various obstacles arose to hinder this plan; until Sir Robert Peel’s Act seemed to open a way for the settlement of the whole affair. A district was formed in its immediate vicinity containing more than 2,000, the Rector still offering the rent charge; and it was laid before the Ecclesiastical Commissioners; but they, for some cause unknown have refused to receive it. At no time since I have held the chapel has its proceeds amounted to more than from £60 to £65. It will contain from 300 to 400 persons, and is generally well filled at both services. I have done my best to keep it in decent repair, but every year adds to its dilapidation and calls for a much larger outlay than I can possibly obtain. Added to this, the year before I entered upon the place (for it is not a parish) there was a large infant school erected, partly by a Government Grant, partly by subscriptions, and partly by a legacy. And this also came upon my hands without any funds to carry it on. The subscriptions I can collect, together with the childrens pence) amount on an average to about £30 to £35 and even to obtain this, I am burdened with a lodger in the schoolhouse, a thing at once very improper and inconvenient in such an establishment. On my first arrival, by retaining the elder children and forming one or two juvenile classes, the numbers steadily increased. This caused opposition, and drawing the children away from me, obliged me to dismiss one of my teachers for want of friends. Yet from past experience I am fully convinced, that could I obtain an official Master and Mistress, I should not only have a good Infant School which would support itself in a great measure but be able to add to it a School of Industry also. The rooms are spacious and well furnished with all necessary apparatus, and the juveniles still in it, making a steady progress. The moral state of the population is very low, and their habits idle, and thriftless to a great degree, making it especially desirable to train up the rising generation amongst these upon better principles. If duly sustained this school might become an especial blessing in this place. But as it is, it must gradually sink. And as I look upon the results measured as they necessarily are of the two years past I grieve to think I must in all human probability send the elder children afloat again amongst evil, whereas by a continuance under present discipline and instruction they would form a future attached and useful congregation. Thus then I present to your view a church and a school (with every apparatus for efficient usefulness in operation on the spot) sinking for want of, and I trust the facts of the case will plead strongly with you sir, to lay before the Council. Nailsworth is situated in a valley 4 miles from Stroud, just at the junction of the 3 parishes of Avening, Horsley and Minchinhampton. Before the transfer of the clothing trade to the northern counties, it was a place of some importance, even now it is a great thoroughfare from Bath, Bristol, Gloucester, Cheltenham, Stroud and many other towns around it. It has still either 9 or 10 cloth mills at work within a mile of the chapel, besides flock mills connected with these and pin and other manufactories in different parts of what has been marked out as its district – but alas! I fear not really to become such. It is only to ascend one of the hills and look down upon the place itself with its small tower in the midst, and the question at once arises, must its doors be shut and the place given to ruin? Such at this moment seems its probable fate. There is not one individual near or in it to help me and as I have not sufficient private property to fall back upon, I feel I must soon give it up unless it is put upon a better foundation. Yet I am willing to work on if possible. Of this also I feel sure, that when the numerous difficulties with which it is beset, come to be laid open, there are few who will be willing to encounter them single handed. ‘After having reconsidered the whole facts of the case, having regard also to the very numerous and urgent claims upon the funds placed at their disposal they see no reason for varying their decision which was communicated in my letter of 18th May’ (25). ‘The difficulties which then stopped me are, I believe, wholly overcome and I have now been requested by the Bishop of Gloucester and Bristol to write to you … to get necessary preliminaries settled so as to allow the church to be consecrated by him about 26th of next month. … The parish of Avening contains (by the census of 1841) a population of 2,227, of this number 1019 live 2 ¼ miles from the parish church. This portion of the parish, called Nailsworth, it is proposed to form into a district chapelry in the patronage of the Rector of Avening. The rent day (?) arising from that part of the parish amounting to between £75-£80. The rest for part of the pews to be part of the stipend of the incumbent’ (27). ‘it was intended, when the church had been consecrated and the district assigned, to endeavour to improve and enlarge the church which it was hopeless to attempt in the present state of things. (The clerk’s house which was not intended for a parsonage house) ‘will be let for the benefit of the incumbent’ (28). The correspondence continued but in 1854 Mr Brooke left Avening and both he and Mr Betts resigned their respective offices in 1857. The Reverend John Betts was curate of Whittington, Lancashire, from 1857 to 1858, perpetual curate of Woolastone, in Gloucestershire, from 1859 and during the years 1860 to 1867 he was the Perpetual Curate of Upton St Leonards. In 1871 we find him living in Bisley Street, Painswick, aged sixty-six-years, without cure of souls. ‘An offer has been made to me by the trustees of the unconsecrated chapel of Nailsworth … There is no endowment save the pew rents – about £60 a year, but the trustees offer a guarantee of £80 a year. The chapel should hold about 400 more or less. If I accepted it I should wish it consecrated and an ecclesiastical parish or chapelry assigned to it…. If you can favour me with as early an answer as you can … you will greatly oblige as the chapel has now been vacant nearly five months’ (30). Nothing seems to have resulted from this initiative and in the event the Reverend Augustus Turner was appointed in 1857. When Mr. Davis applied again in 1864 he was respectfully turned down because a sufficient stipend could not be offered to him (31). The Reverend Augustus Turner was clearly a wealthy man. He was baptised on 6th February 1821 at Child Okeford in Dorset, the son of Samuel Charles and Susannah Turner. He studied at Sidney Sussex College, Cambridge, and was ordained deacon in 1845 and served his title at Amberley until 1848. He then spent a year as chaplain to Dorchester Infirmary before being appointed as Curate of Durweston in Dorset from 1850 until 1856. During 1856 Augustus Turner moved to Moreton-in-the-Marsh and at about this time he seems to have married Elizabeth Head Dalton, only daughter of Dr Edward Dalton of Dunkirk House. At this point the Reverend Augustus Turner took up the living of Nailsworth until 1861. He had relinquished his office by the time of the census when he was living at Spring Hill, Nailsworth, and was described as a clergyman without cure of souls. Living next door to them was the minister Mr William Lewis Mills and his family. In 1866 Mr Turner moved to Ipswich and then from 1867 until 1876 he served as the Vicar of Colerne in Wiltshire. By 1881 he had retired and he and his wife and their six children had returned to the Nailsworth area to live at Dunkirk House, formerly the home of his father-in-law, Dr Edward Dalton, and also of his predecessor the Reverend Henry Campbell. The Turners were still living there ten years later. His wife died in 1897 and he died in 1902 and was buried at Amberley. ‘While its consecration … with the the patronage reserved to the Trustees, and an ecclesiastical parish assigned to it, would be a great advantage to the neighbourhood, yet better is it for Nailsworth to have its Chapel unconsecrated than to lose the advantage of a patronage held by parties who know the wants of the place, than (in violation of the obvious spirit of the Rust Deed) to surrender the patronage to a Rector of Avening put in by the chance purchase of the advowson, or to the Bishop for the time being who might be of very different views from the present occupant of the See’ (32). He added that amongst the local traditions associated with Nailsworth Chapel there is one that a former bishop, on being referred to respecting its consecration, is reported to have said that the fact of Divine Service having been performed in it so long was a far better consecration than any he could give’ . Finally the correspondent mentioned that a former minister of Nailsworth Chapel had been offered the Bishopric of Manchester but had ‘declined the dignity’. Manchester diocese was created in 1847. From 1859 to 1860 the minister of the Pepper Pot was the Reverend Allen Weare Gardiner who was the only son of the ‘Missionary Martyr’, Allen Francis Gardiner (1794-1851). Allen was born in Reading during 1832. He attended University College, Oxford, and gained his B.A. in 1855 and was granted his M.A. two years later. During these years he was exploring Patagonia as a missionary. He returned to England and during October 1858 married Eliza Rose, the second daughter of the Reverend Samuel Lloyd of Stanley Hall, Gloucestershire. Mr Lloyd had been Vicar of Horsley and his only son became, for a brief time, Minister at Inchbrook and his son-in-law, the Reverend Vaughan Simpson Fox, built All Saints’ Church, Shortwood. Allen and Eliza’s daughter, Emily Rose Gardiner, was born on 22nd October 1859 in the Stroud Registration District. From 1869 until 1873 Mr Gardiner acted as Chaplain of Lota in Chile and from 1874 until his death in 1878 as the Chaplain to the Bishop of Bathurst in New South Wales. Gardiner was the fifth son of Samuel Gardiner of Coombe Lodge, Oxfordshire, by Mary, daughter of Charles Boddam of Capel House, Bull’s Cross, Enfield, Middlesex. He was born on 28 January 1794 in the parsonage house at Basildon, Berkshire, where his parents were temporarily residing. He was religiously educated, and in May 1808 entered the Royal Naval College, Portsmouth. On 20 June 1810 he went to sea as a volunteer on board Template:HM, and after a time removing to the Phœbe, he served in that ship as midshipman until August 1814, when, having distinguished himself in the capture of the American frigate Essex, he was sent to England as acting lieutenant of that prize. Being confirmed as lieutenant 13 December he afterwards served in the Ganymede, the Leander, and the Dauntless in various parts of the world, and returned invalided to Portsmouth 31 October 1822. On 1 July in the following year he married Julia Susanna, second daughter of John Reade of Ipsden House, Ipsden, Oxfordshire; she died in the Isle of Wight on 23 May 1834. As second lieutenant of the Jupiter he was at Newfoundland in 1824, and in 1825 came back to England in charge of the Clinker, when he obtained his promotion as commander 13 September 1826, after which period, although he often applied for employment, he never succeeded in obtaining any other appointment. Long before this his attention had been much directed—to the contemporary British view—to the unreclaimed state of the heathen nations, and he now resolved that he would devote his life to the work of a missionary pioneer. With this view he went to Africa in 1834, and, exploring the Zulu country, started the first missionary station at Port Natal. From 1834 to 1838 he was engaged in earnest endeavours to establish Christian churches in Zululand, but political events and native wars combined to prevent any permanent success. From 1838 to 1843 he laboured among the Indians of Chile, and went from island to island in the Indian Archipelago, but his efforts were foiled by the opposition of the various governments. His first visit to Tierra del Fuego took place 22 March 1842, when, coming from the Falkland Islands in the schooner Montgomery, he landed in Oazy harbour. The Church Missionary Society was now pressed to send out missionaries to Patagonia, but declined on the ground of want of funds. Similar proposals were unsuccessfully made to the Wesleyan and London Missionary Societies. At length in 1844 a special society was formed for South America, which took the name of the Patagonian Missionary Society, and Robert Hunt, a schoolmaster, was sent out as the first missionary, being accompanied by Gardiner. This attempt to establish a mission, however, failed, and they returned to England in June 1845. Gardiner, not discouraged, left England again 23 September 1845, and, in company with Federico Gonzales, a Spanish Protestant, from whom he learnt Spanish, went to Bolivia, where he distributed bibles to the Indian population, but not without much opposition from the Roman Catholics. Having established Gonzales as a missionary at Potosi, he himself came back to England, landing at Southampton 8 February 1847. He spent 1848 in making a survey of Tierra del Fuego with a view to a mission, and suffered great hardships. He then endeavoured to interest the Moravian Brethren and the Foreign Missions of the Church of Scotland in this enterprise, but neither of them was in a position to render any aid. At last, a lady at Cheltenham having given £700, the mission was determined on. Accompanied by Richard Williams, surgeon, Joseph Erwin, ship-carpenter, John Maidment, catechist, and three Cornish fishermen, Pearce, Badcock, and Bryant, he sailed from Liverpool 7 September 1850 in the Ocean Queen, and was landed at Picton Island 5 December. He had with him two launches, each twenty-six feet long, in which had been stowed provisions to last for six months. The Yahgan people were hostile and great thieves; the climate was severe and the country barren. Six months elapsed without the arrival of further supplies, which were detained at the Falkland Islands for want of a vessel. The unfortunate men gradually died of starvation, Gardiner, himself the last survivor, expiring, as it is believed, 6 September 1851. On 21 October the John Davison, sent for their succour, arrived, and on 6 Jan. 1852 HMS Dido visited the place, but all they could do was to bury the bodies and bring away Gardiner’s journal. Two years later, in 1854, the Allen Gardiner, an 88-ton schooner, was sent out to Patagonia as a missionary ship, and in 1856 Captain Gardiner’s only son, Allen W. Gardiner, went to that country as a missionary. Gardiner married secondly, 7 October 1836, Elizabeth Lydia, eldest daughter of the Rev. Edward Garrard Marsh, vicar of Aylesford, Kent. Mr Gardiner was succeeded during the years 1860 to 1865 by the Reverend William Lewis Mills. In the 1861 census return he and his wife were living in Spring Hill, with their four-year-old daughter, Annie. Mr Mills was then aged fifty-eight and was listed as a native of Clerkenwell, London. At the time of the 1851 census he had been curate of Stonehouse. After he left Nailsworth he was from 1868-1878 the curate of Harescombe with Pitchcombe and from 1878-1882 the Rector of Redmarley D’Abitot after which he retired to Weston-super-Mare. During the mid 1860s significant initiatives were to be realised in the Nailsworth area which would change the Anglican Church there for some years to come. In 1821 the Forest Green Congregational Church was rebuilt at the top of Spring Hill and some of the members decided that they wished to remain close to the historic site of their first chapel and built another church for themselves close-by. This division weakened the Congregational or Independent presence in the area for a while but at the time of the 1851 Religious Census the Lower Chapel could boast of four hundred adult worshippers and the Upper Chapel one hundred and sixty. Also in 1838 a new British School had been erected close to the Lower Chapel. In early 1844, William Leigh, an Oxford convert, was received into full communion with the Roman Catholic Church (1). Sometime during 1846 he purchased Spring Park, Woodchester, from Lord Ducie ‘with the deliberate intention of making it a Catholic centre in a district where the Catholic tradition had been completely lost’ (2). He asked Bishop Nicholas Wiseman to recommend a suitable community to assist and Wiseman suggested the Passionists. The Passionist superior was Father Dominic Barberi, who was an Italian missionary who had arrived in England in 1840. He later received Doctor, now Blessed, John Henry Newman into the fold of the Roman Catholic Church. Mr Leigh rented Northfield House, Forest Green, which had been built as the Congregational manse in 1708, with its adjoining schoolroom, as a temporary house for these religious. The property was hired for £20 per annum from the minister ‘who little suspected that his place was to be a receptacle for the professors of Popery’. Father Dominic arrived with a lay-brother and the first Mass was celebrated in Nailsworth, on the Feast of the Annunciation 1846 in a make-shift chapel. The arrival of the Passionists aroused considerable interest and curiosity in the district. On Palm Sunday, for example, about eighty people attended in the morning and the numbers increasing to nearly three hundred in the evening. The services were held in the former schoolroom which was now fitted up as a chapel. On Good Friday 1846 Father Dominic preached three times on the Passion of Our Lord and the Sorrows of Mary and on each occasion the chapel was packed to the door, and many were congregated outside around the windows and doors. Father Dominic later wrote, ‘I have found many non-Catholics here who could not tell me clearly who Jesus Christ was’ and it was possibly this that encouraged him to arrange for Mrs Catherine Kemball to open a Catholic boarding school for young ladies in her house at Inchbrook. Her school continued at her home, Mount Pleasant, until 1848. During March 1849 the Passionist Retreat was moved from Northfield House to Park Hill (now St Mary’s Hill House). On 27th August 1849 Father Dominic Barberi died whilst travelling to Woodchester for the opening of the completed Church of Our Lady of the Annunciation. The Passionists soon made way for the Dominican Friars and on 27th October 1963 Father Dominic of the Mother of God was beatified by Pope Paul VI in Rome. Sometime prior to 1865 it was decided to build an Anglican Church to serve the Inchbrook and Forest Green parts of Avening Parish and to withstand the continued success of the Congregationalists and the new threat to the Established Church posed by the nearby Dominican Priory. A site was acquired and on Easter Sunday 1865 a small corrugated iron mission church was opened at Inchbrook. The cost was £300. The chapel was owned by trustees who appointed a minister. The building was unconsecrated and consisted of a nave with 160 sittings, chancel and eastern vestry. The western bell turret culminated in a small spire. The first minister at Inchbrook would appear to be the Reverend Anthony Ralph D’Arcy. He was born in 1832 at Ginnet’s Park, West Meath, the son of John and Mary-Anne D’Arcy. He was made a deacon and served his title as Curate of Edleston in Derbyshire (1859-1861) and then worked in Tenby. From 1865 until 1868 he served at Inchbrook. He was married to Caroline Brierley, a native of Dublin, and by the time of the 1881 census they had at least five children. Mr D’Arcy was succeeded at Inchbrook by the Reverend Thomas Alexander Aylmer Hughes, another Irishman, who was born in Kilkenny and studied at Trinity College, Dublin. He was ordained by the Bishop of Lichfield in 1858 and worked as a curate in Burton-on-Trent, Davenham in Cheshire and he was Associate Secretary for the Irish Church Missions. He served the church at Inchbrook from 1868 until 1875. At the time of the 1871 census Mr. Hughes was aged thirty-six-years and living at Dunkirk with his wife Emmeline and their two children, aged two years and one year. He is described in the return as the Curate of Avening. In 1901 Mr Hughes was the Vicar of Shelf in Yorkshire. In 1875 the trustees of Nailsworth Chapel suggested a scheme whereby the trustees of both Nailsworth and Inchbrook each provided £150 towards a minister who would serve both chapels and £30 would be made available for an assistant curate. From 1875 until 1885 the livings of Nailsworth and Inchbrook were thus linked and Mr D’Arcy returned to the area to serve as Minister of both chapels from 1875 until 1879. During the years in between he had been the incumbent of Kensington Chapel, Bath (1868-1872) and curate at Eastington (1872-1875). Eventually Mr D’Arcy left Nailsworth to become the Rector of Nympsfield and on the night of the 1881 census he was staying with the Vicar of Oakridge, a fellow Irishman, the Reverend Arthur P. Doherty. He died on 17th September 1894 aged sixty-two-years and is buried with his widow at Nympsfield where he spent the last sixteen years of his life. Crockford’s Directory for 1880 states that the living of Inchbrook, which was the gift of proprietors, was worth £200 per annum whereas Nailsworth, which was the gift of trustees and the Rector of Avening, was worth only £150 per annum. Dr James Pratt succeeded Mr D’Arcy and at the time of the 1881 census he too was listed in the return as Incumbent of both places. Interestingly he was also a native of Ireland. An infant school, supported by the Playne Family, was commenced at Inchbrook sometime before 1879 and in 1885 there was an average attendance of sixty. In 1885 the Inchbrook trustees decided to withdraw from the scheme of having a shared incumbent and Mr Thomas Lancaster, of Bownham Park, wrote to the Nailsworth trustees annulling the arrangements. From 1885 until 1886 the Reverend William Henry Lloyd was briefly minister at Inchbrook. He was the only son of the Reverend Samuel Lloyd M.A., a former Vicar of Horsley from 1825-1849, who later lived at Stanley House until his death in 1863. His sons-in-law included the Reverend Allen Weare Gardiner who was for a time Minister at Nailsworth and the Reverend Vaughan Simpson Fox who built All Saints, Shortwood. Mr W.H. Lloyd had returned to England, having been the chaplain at Valparaiso for thirteen years, to become curate of St Luke’s, Cheltenham. Previously he had worked in Claydon, Worcester and Eastbourne. The last full-time minister to be appointed to Inchbrook Church was the Reverend Henry Alfred Crabbe who began his ministry there in 1886 Two years later his name is listed as a subscriber of one guinea towards the erection of the new parochial schools at Amberley. At the time of the 1891 census he and his family were living on the Stroud Road. He was described as thirty-five-years-old and he was born in London. His two children, aged seven and five, were both born in Bristol. Mr Crabbe had trained for ministry at Gloucester Theological College and had served his title at St Michael and All Angels in Bristol. In 1901 he was Vicar of Bretby in Derbyshire. In 1889 the minister received an income of £200 and the living was in the gift of four trustees, namely Mr Thomas Lancaster of Bownham Park, Mr C.R. Baynes, Mrs Whitehead and Mrs Louisa Frith, the widow of J.G. Frith, of The Highlands, who was also the patron of Amberley Parish. Of the trustees Mr Thomas Lancaster of Bownham Park was a manager and auditor of Amberley School as well as being a generous benefactor and Churchwarden of Amberley Church and Parochial Schools. A plaque in Amberley Church commemorates his life and a stone plaque at Brimscombe recalls his building of the school there. In 1891 he was living at Bownham with his niece, Miss Emma Molyneux. J.G. Frith, a London business man, had in 1861 purchased The Highlands, and the present house (now Beaudesert School) was being built when he died in 1868. The Friths had for many years been friends of the Lancasters of Bownham Park. Louisa Frith, his widow, was a generous supporter in her own right not only of Amberley Church but also of Amberley Parochial Schools which were commenced in 1887. She resided at The Highlands until 1897 when she died and then the property was bequeathed to her eldest daughter, Caroline, the widow of the Rev. R.E. Blackwell, the first incumbent at Amberley. The Blackwells had married in 1863 and after his retirement they lived at The Highlands until the former vicar’s death in 1878. Mrs Whitehead was the widow of Ralph Ratcliffe Whitehead, a cotton manufacturer, who was living at Amberley Court. He was involved with Amberley Church and when he died in 1871 his widow continued to live at Amberley Court until about 1879. Charles R. Baynes, was a retired Indian civil servant, living at The Lammas, Minchinhampton. In 1892 Mr Crabbe left Inchbrook to study at Durham and during the following year he was replaced by the Rev Gilbert Maxwell Scott, who was already the minister at Nailsworth, and he was soon to become the first Vicar of the new parish. There is a letter surviving from 1898 which discusses the vesting of the trusteeship of Inchbrook Church in the Incumbent of Nailsworth. In 1895 Miss Molyneux, one of the trustees of Inchbrook Church, financed the re-building of Inchbrook School. Miss Molyneux was responsible for enlarging Brimscombe School and she supported many other charitable works in the area. Inchbrook School was built in memory of her uncle, Mr Lancaster, of Bownham Park, Amberley, who had also been a trustee of the church at Inchbrook. The cornerstone of Inchbrook School was laid by her cousin, Colonel Molyneux, on 20th June 1895 and on that happy occasion the children were all presented with buns. Miss Molyneux was sadly ill on the great day so she was later presented with the trowel as a memento. The building was designed by Matthew Henry Medland who later be came the County architect and responsible for numerous public buildings in Gloucestershire. On Easter Sunday 1902 twenty-five people communicated at Inchbrook. The church was fairly active with its own choir, thriving Sunday school and day school. Mr Gillman was organist from 1865 until 1905 and Mrs Seabin Freem was also verger for forty years also. In 1915 the Vestry Minutes reveal that there was then a proposal to pull down the church. In the event, during 1921, a legacy of Mrs M. Pimbury was received to provide for the re-building, repair and decoration of the building. In 1912 the Inchbrook Infants School had an average attendance of thirty-seven but this fell to seventeen in 1932 when the school was closed. The building re-opened as an Infant school annexe from 1957 until 1966. Inchbrook Church itself was finally closed on 16th April 1976. It had fallen into a poor state of repair and was poorly attended. Back in 1968 it had been renovated and the spire was removed from the bell turret. Some of the furnishings, including the small font, can be found in St George’s Church today. The site of the chapel was sold ten years later for housing together with the former Inchbrook Infant School building which is now a private dwelling. During these years there were still plans being discussed for the creation of an ecclesiastical parish or district and for the Pepper Pot to be consecrated. In 1876 a scheme was proposed by the trustees to establish a new parish by purchasing the advowson of the parish of Avening and then to place the advowson into the hands of Simeon’s Trustees or the Church Patronage Society after first setting an endowment of possibly £400 per annum on Nailsworth. The cost of the advowson was £3,500 of which Simeon’s Trustees intimated that they would contribute £2,000. The scheme collapsed when complications were discovered by the legal advisors of Simeon’s Trustees. The chapelwardens or trustees of Nailsworth Chapel were periodically replaced when vacancies occurred through death, and on one occasion there were five vacancies. The new trustees were often related and the names of Playne and Smith predominate throughout the century. For many years the Playnes and the Smiths were clothiers and Daniel Smith married Martha Playne of Longfords. Their son, William Smith (1808-1861) became a lawyer and he set up a practice in 1835 in Nailsworth. William Smith’s brother George Birt Smith worked with him in offices at High Beeches in Nailsworth. Alfred Edward Smith (1848-1920), son of Peter Playne Smith (1810-1899) and nephew of William and George, became a partner in the firm and it was when his son Geoffrey joined him that the firm became A. E. Smith & Son. Geoffrey was the last partner of the firm descended from the original family. William Smith is remembered by the ‘Upright Lawyer Fountain’, erected in his memory in 1862. In 1861 he was a fifty-three-year-old solicitor living at High Beeches with his two brothers and three unmarried sisters. He was described as a ‘peacemaker and honest Lawyer’ who worked hard to secure a pure drinking water supply for the town. Alfred Edward Smith, his nephew, was elected a trustee in 1885. He married Ellen Pavey, daughter of Dr. Henry Pavey, a surgeon of Chapel Street. The Smiths lived at ‘The Hollies’, Nailsworth Hill. He became one of the first churchwardens in 1895 and was a major benefactor of the new parish church. He was the first Clerk to the Urban District Council. 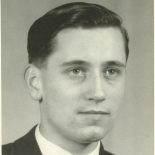 His son, Dr A. B. Pavey Smith was a keen local historian. Alfred Edward Smith died on 3rd September 1920 and probate was granted to his widow and son Geoffrey. His effects were valued at £12, 641. Ellen Smith died in her ninety-second year on 28th December 1944. She had served as President of the Nailsworth Nursing Association. In 1871 we find an early reference to Nailsworth Chapel being dedicated to St George. The minister from 1865-1875, the Reverend Edward Thomas Watson Thomas, was listed in the census return as ‘Chaplain of St George’s Episcopal Chapel, Nailsworth, M.A. Cambridge’ He was then forty-four-years-old and born at Pentonville. Edward and Caroline Thomas had nine children, including two sets of twins, and were living in Stroud Road. Ten years previously Thomas was curate in Melksham and in December 1875 he was appointed as Vicar of St Mark’s Church in Gloucester where he remained for ten years. He died suddenly in his sleep in the autumn of 1885 aged fifty-eight-years. His last entry in St Mark’s service book was made on October 11th of that year. From 1875 until 1879 both Inchbrook and Nailsworth were served by the Reverend Anthony Ralph D’Arcy. When he was appointed as Rector of Nympsfield the trustees appointed the Reverend James Pratt D.D. as the new minister for Inchbrook and Nailsworth. He was there from 1879 until the year 1886 when he returned to Ireland and eight years later was living at Clonskeagh in County Dublin. Dr Pratt was born in about 1822 in Ireland and studied at Trinity College, Dublin. He was made a deacon in Dublin during 1848 and ordained priest in Limerick. From 1848 until 1852 he was curate of Killeney in Dublin and then at Roscreah (1852-54). He was later chaplain at Greystones in County Wicklow (1860-62) and Rector of Clontarf in County Dublin (1862-1875). He gained his D.D. just four years before his appointed to the living of Nailsworth and Inchbrook. Whilst working in Nailsworth Dr Pratt published his ‘Metrical Version of Solomon’s Song’ (1881). During 1881 St George’s Church was extensively renovated. The sittings were re-arranged to provide 150 more seats in the galleries. The building was also plastered and re-roofed at a total cost of £190. Dr Pratt presented a new pulpit for the chapel and a new organ was built by Nicholson and Lord for £192. This organ was a modest instrument but it is still in use in the present parish church. It was over-hauled in 1957 by Osmonds of Taunton and further over-hauled and enlarged in 1977 at a cost of £5,500. In 1883 a new National School was erected in Nailsworth, close to St George’s Church. There was an average attendance of 129 in 1885. During the year 1886 Dr Pratt was succeeded by Dr Peake. Frederic Peake was born in about 1840 in London and was educated at Trinity College, Dublin. He served his title at Maryport (1867-70) and was then appointed as Principal of the Church Missionary College at Tunnevelly (1870-71) when he also gained his doctorate in Law. His next appointment was as Curate at St Luke’s Southsea (1872-73) and then we find him working as the Assistant Secretary of the Church Pastoral Aid Society (1873-1880) in Leeds. At the time of the 1881 census he was listed in the returns as the Minister of St Silas’s Episcopal Church in North Gate, West End Park, Glasgow. In 1891 Dr Peake and his wife, Anna, resided at ‘Morning Side’, Spring Hill, Nailsworth, with their nephew, Robert Peake, a bank clerk. In January 1888 Dr Peake produced the first church magazine for Nailsworth ‘to afford a means of communication between minister and people’. These volumes provide a fascinating record of local Anglican life over many years. During 1892 Dr and Mrs Peake left Nailsworth for London to become Secretary of the Lord’s Day Observance Society. The departure of this minister, for whom we have the first photograph in the ‘rogues gallery’ displayed in the clergy vestry, together with Mr Crabbe at Inchbrook, marks the end of a phase of Anglican life in the Nailsworth area. Shortwood Baptist Chapel was erected in 1716 and at one time it was one of the most important Baptist causes out of London, having over 600 church members. It was set in a large cemetery and in 1757 the church purchased the premises on which the minister’s house was afterwards built, at Tickmore End. Significant pastors included the Reverend Benjamin Francis who served as minister from 1757 until 1799, the Reverend William Winterbotham from 1804 until 1829 and the Reverend T.F. Newman from 1832 until 1864. The chapel was rebuilt in 1837 and thirteen years later the congregation was said to number at least 1,000. In 1820 a Wesleyan Methodist Church was established at Downend which had a congregation numbering 200 at the time of the 1851 Religious Census. The Vicar of Horsley from 1862 to 1869 was the Reverend Vaughan Simpson Fox. He was the son of a doctor of medicine and studied at Balliol College, Oxford, and gained his M.A. in 1858. He was appointed as curate of Leonard Stanley and during November 1860 he married Emily Frances, third daughter of the Reverend Samuel Lloyd of Stanley House. Mr Samuel Lloyd was previously Vicar of Horsley from 1825 until 1849. Initially the young married couple were living at Leonard Stanley where he was working as the curate. Emily Frances’s sister was married to The Reverend Allen Weare Gardiner, who was for a time Minister at Nailsworth and her brother was for a time Minister at Inchbrook. His widow later described how he had ‘earnest desires and long cherished plans for the good of that portion of Horsley parish’ known as Shortwood and that he decided that he wanted to build a chapel-of-ease there. Divine services had been conducted at Shortwood since 1853 by the Vicar of Horsley who made use of the old work house there. The site, which was very close to the rebuilt Shortwood Baptist Chapel, was made available by a friend of the Vicar and during 1864 plans were drawn up by William Clissold of Stroud. The chapel was erected by Mr Edmund Clayfield of Horsley using stone from the old workhouse. The building was a relatively simple structure consisting of a chancel, nave, south porch, vestry and bell turret. The carved stone font and other carved stone detailing enhanced what was a fairly plain little church. ‘The Builder’ for 19th August 1865 reported in its columns that a new chapel-of-ease had been built on the site of the old poorhouse at Shortwood and that it had been opened for divine service. The total cost, including the purchase of the site, was £900 of which £800 had already been collected. ‘The Builder’, for 23rd June 1866, reported that the new church was consecrated and included a nave and chancel with a seating capacity of 200 and all the seats were free. The style was described as ‘Early Decorated’ and elsewhere as ‘Thirteenth Century’. The main body of the nave had windows on either side each comprising of two lights with circular lights above. The glass in these windows had purple, blue, red and yellow borders. The pointed roof has stained rafters supported by carved freestone corbels. A plaque in memory of Mr Fox was later placed in the church, marking his untimely death which took place at Stanley House, Stroud, on 27th February 1869. He was aged thirty-four-years and at the time of his death he was Vicar of St Mary’s, Spring Grove, Middlesex. All Saints’ Shortwood was served for a time by an assistant curate who had a specific responsibility for the church as a condition for a grant from the Assistant Curates’ Fund. In 1881 the neighbouring Baptist Church was demolished and relocated nearer to the town centre. From 1895 until 1901 All Saints’ Church became the Parish Church for Nailsworth but after that date its fortunes fell dramatically. On Easter Sunday 1902 only four received Holy Communion there. Three years later, in 1905, the church was so poorly attended that the Vicar said that he found it impossible to conduct the Sunday afternoon service there because he ran a boys’ bible reading class in Nailsworth at the same time. He asked the Bishop of Gloucester to declare it a mortuary chapel as the new cemetery had been consecrated there on 12th August 1905. The Bishop approved the scheme but made a condition that there should be a monthly Holy Communion Service and another service occasionally. Marriages ceased there from 1901. During the early 1970s Miss Brown of Shortwood House was a great friend of All Saints’ Church and the parish fete would be held in her garden. The decision was finally taken to close All Saints’ Church at Shortwood during the summer of 2009 due both to a lack of attendance at services (peaking at around twenty) and the large potential expenditure required to make the building structurally safe. An architectural survey conducted during the autumn of 2008 reported that cracks in the arches of the church could be caused by the heavy roof which is pushing out one of the walls. The church was costing roughly £1,000 to run per year and over the last ten years £20,000 had been spent on repairs. The last service was held on 1st November 2009, poignantly All Saints’ Day. During the nineteenth century Nailsworth changed from a scattered community of cottagers reliant on the woollen cloth industry into a prosperous little town. The cloth mills slowly gave way to light industry and new industries such as the Brewery and Hilliers’ Bacon Curing Company employed a proportion of the workforce. Social improvements included the Midland Railway, opened in 1864, the Subscription Rooms of 1852 and the Police Station and Magistrates’ Courts of 1877 (1). In 1840 the town had its own Board of Health, a street watering committee from 1849 and during the following year a sick fund was established. From 1839 a small unchartered market was held in Market Street on Saturdays and a cattle market began in 1867 (2). In 1891 Fountain Street was opened which necessitated the demolition of part of Day’s mill. The ponds of Day’s Mill still occupied what we now know as Old Market. In 1888 the Local Government Act was passed which gave authority for new civil parishes to be set-up. In 1889 a meeting was held to discuss the case of Nailsworth and a public enquiry resulted. Initial plans were not accepted as the boundaries were considered too large, however, amended boundaries were approved by the inhabitants on 24th May 1891. On 26th March 1892 the town was constituted a civil parish by order of the County Council (3). The town became one of the smallest Urban Districts in the country in 1894 which continued until local government reorganization in 1974. Within the parts of Nailsworth still within the ancient parish of Avening the adherents of the Established Church were meanwhile gathering for worship in two un-consecrated buildings and their clergy were appointed by trustees. From 1857 until 1897 the Rector of Avening was the Reverend Francis de Paravicini and the patron of the parish, from some time before 1892, was the Reverend Edgar William Edwards (6). In 1892 Mr. Edwards offered to make over the tithes of the Nailsworth Tything at the end of the present incumbency (7). He, himself, became the Rector of Avening in 1897. When Dr Peake resigned from St George’s Nailsworth he was succeeded by the Reverend Gilbert Maxwell Scott, who was the man who was to lead the Anglicans of Nailsworth through its years of major upheaval. Gilbert Scott was born in the Birkenhead area in about 1864. At the time of the 1881 census he was boarding at Downham Rectory, Billericay, with a late consular chaplain who was incumbent of the parish. Gilbert was himself described as an army pupil. He was later educated at Jesus College, Oxford where he gained his B.A. in 1885 and his M.A. four years later. He spent a year at Wycliffe Hall in Oxford before he was made a deacon in 1886 and appointed to serve his title at St John the Evangelist in Reading where he remained until his appointment to Nailsworth. Mr Scott’s work in forming a consolidated chapelry commenced in November 1892 when he was invited to serve Inchbrook as well as Nailsworth. The 1894 Crockford’s Directory listed his gross income as £290 per annum, which included money resulting from pew rents. During the March of 1893 the Reverend Robert Dickson Cruikshank was appointed as his assistant curate (8). He had been made a deacon in 1890 and had served his title at St Nicholas’s Church in Bristol. During the February of 1894 Shortwood was unofficially annexed with the co-operation of the Vicar of Horsley, Mr Pidcock, whose assistant, Mr Veasey, had just left Horsley Parish. The new plan for the forming of a consolidated chapelry was no doubt influenced by the establishment of the new Civil Parish of Nailsworth as the proposed chapelry closely followed the boundaries of the civil parish. The chapelry was to be formed out of the ecclesiastical parishes of Avening, Horsley, Minchinhampton and Amberley and it was only where part of Amberley village itself lay in the civil parish that the boundaries differed. This area was obviously better cared for by Mr. Summerhayes, the Rector of Amberley. The endowment for the Living included £700 raised by the parish matched by £700 granted by the Ecclesiastical Commissioners. By March 1896 a further £500 was added creating a total of £2,400 which was to be held in trust. This produced an annual interest of £75 for the Vicar’s stipend. Further income came from the trustees of Inchbrook and Nailsworth chapels and the tithes resigned by the incumbents of the four benefices. In 1898 the Rector of Avening assigned £100 of the tithe rent charge to support Nailsworth Chapel (10). In 1897 the £100 income from Inchbrook Church ceased and in compensation Miss Molyneux made a gift of £500 and Mrs Frith gave £300. Further grants of £700 and £200 were made by the Ecclesiastical Commissioners and Queen Anne’s Bounty, respectively, enlarging the endowment fund still further. The consolidated Chapelry was later created a Perpetual Curacy and later a Vicarage, the patronage being held by the Bishopric of Gloucester (11). The Diocese of Bristol was separated from Gloucester in 1897 having been held together for sixty-one years (12). Dr Charles John Ellicott was Bishop from 1863 and he continued at Gloucester until 1905 (13). The Consolidated Chapelry was assigned to the Church of All Saints at Shortwood because it was the only church legally consecrated. The building contained only two hundred sittings and, because of its location, a mile from the town centre, this was regared as only a temporary parish church until St George’s Church could be re-built or consecrated. Mr Scott was inducted at All Saints’ on 30th July 1895 (14) and Mr Alfred Edward Smith and Mr T. Cox were elected as the first churchwardens by the Vestry Meeting. The first marriage ceremony was celebrated at All Saints’ on 23rd September 1895 between Alfred Stringer and Alice Elizabeth Drake (15). Weddings were able to be solemnised at Nailsworth as well from October 1895. Burials took place at Shortwood where there was a churchyard. During the year 1894 Mr Scott managed to acquire a building in Church Street, Nailsworth, for use as a parish hall but this was later incorporated into the school complex. From as early as 1892 an unofficial fund had been launched for the erection of a new church in the town centre. In the parish magazine for September 1893 Mr Scott expressed his desire for a new church for Nailsworth. He stated that a larger building was required for the growing town as there were only thirty-two free sittings in the existing Nailsworth Chapel, and the existing chancel was cluttered. He also referred to Nailsworth Chapel not being legally consecrated and still in the ownership of trustees who could actually close the chapel at any time and sell it for secular usage should the subscriptions and pew rents prove insufficient to maintain the building and support the minister (16). The establishment of the established chapelry to All Saints’s Shortwood in March 1895 in many ways highlighted the inappropriateness of the situation. As a result money flowed into the building fund. In December 1895 Mr Scott reported in the parish magazine that several architects had submitted plans. On 22nd October 1896 an official building Fund was launched as the result of a public meeting held in the school room to discuss the proposal. A list of subscribers was opened and a building committee was appointed. During the meeting it was agreed that a completely new place-of-worship should be erected containing plenty of free sittings and to collect a large proportion of the funds necessary locally before appealing for outside help (17). Mr Alfred Edward Smith, one of the churchwardens, responded to this development by writing to Mr Scott and offering a donation of £500. This sum was offered on the condition that the parish raised £1,500 locally, in excess of the £1,000 already raised, by 30th June 1897. The fundraisers met the challenge and strove to have a church ‘begun and completed as soon as possible’ (18). During November 1896, as the result of several meetings, the members of the Building Committee resolved that, ‘subject to the approval of his estimate and modifications agreed on, the committee adopt Mr Medland’s plan’ (19). Matthew Henry Medland, F.R.I.B.A., son of the architect James Medland (1820-1885), was a Gloucester architect who had designed the Council Chamber of the Shire Hall at Gloucester in 1894 and, already locally, Inchbrook School in 1895 (20). His plan consisted of the erection of the present nave with a massive tower soaring above the south porch. The chancel was to be flanked on the south side by a Lady Chapel with a sacristy beyond. On the north side of the chancel an organ chamber with a large vestry was planned. The sacristy and vestry were to be linked by an eastern porch with its own entrance and porch. An ornate reredos was designed for the High Altar. The whole design was influenced by Early English stylistic principles and the building was to be constructed out of rusticated Cotswold stone. The total building as proposed was to extend considerably further east than the present parish church and its completion would have necessitated the demolition of the National School (21). The Bishop of Gloucester had suggested building a new chancel and retaining the nave of the Pepper Pot as a temporary measure. It was finally decided to build the first stage of Mr Medland’s design schedule which would comprise of the nave, aisles, tower, base of the tower up to sixteen feet and the north porch. Fundraising continued throughout the year 1897. The parish magazine is a great source for progress reports and in March 1897 the fund had reached £700 to which a Miss Wells added a further £100. In May 1897 the Fund stood at £1,167-14-1d. Money was raised through the holding of numerous bazaars, collections, subscription lists and individual effort and generosity. From 1895 Mr Scott even contributed his Easter Offering to the Fund. The £1,500 target was eventually realised and with Mr Smith’s promised £500. Having commissioned an architect the Building Committee next appointed the builder. On 26th October 1897 the members of the committee accepted the tender submitted by Messrs Wall and Hook of Chalford. They offered the lowest quotation at £5,200 which could be reduced by £530 if certain portions of the work were postponed. The Building Committee requested Wall and Hook to keep their tender open for six months so that the work could be commenced as soon as sufficient funds became available. £1,570 was still required before work could commence. Having now raised a substantial portion of the sum required through local fundraising, the members of the Building Committee decided to appeal for help from those outside the parish. Mr A.E. Smith was confident that money would be forthcoming for ‘a church on such a magnificent site’. The site did, however, have some disadvantages as the slope was awkward and would require expensive foundations. On 15th May 1898 Nailsworth Chapel, the Pepper Pot, was packed for the final service to be held there. The structure was then demolished and, under one large stone, were found three halfpennies dated 1773. Various furnishings were removed including the Royal Coat–of-Arms of King George III, the organ, the pulpit and the Nathaniel Dyer Memorial. Two of the urns from the roof were placed in the grounds of ‘The Hollies’, the home of Mr A.E. Smith. As the new church would not have a tower for some years the old clock in the Pepper Pot tower was without a home. From the 31st March 1896 Nailsworth Urban District Council ‘undertook the repairing, maintaining and winding of the public clock’ () William George Clissold, prominent Baptist, brewer and first Chairman of the Urban District Council, in 1898, erected at his own expense a temporary clock tower for the service of the inhabitants. This wooden structure, situated on the church bank, in Fountain Street, cost £80 and it served its purpose until 1951. Today some of this structure is still visible in the retaining wall which supports the church bank. From June 1898 services were held in a temporary corrugated iron church which was erected in the garden of ‘The Chantry’ (later the Vicarage), the home of M. Scott. This ‘tin tabernacle’ consisted of nave, apsidal chancel and a small vestry. Only few of the two hundred and seventy seats were free so, we read in the magazine, Mr Scott requested those who had no seats to stand until the beginning of the service when they could move into any vacant ones. Marriages were solemnised in the temporary tin church from August 1898 when a licence was obtained for the building because inclement weather made weddings at Shortwood difficult. The tin church was purchased from the parish of St Katherine in Ledbury and it was remained in Nailsworth until April 1901. It was eventually sold for £105 to Messrs J. Rolfe of Shepherd’s Bush, London, who re-erected it at Neasdon. This temporary church required maintenance during its Nailsworth years and parts were renewed and re-varnished. With the Pepper Pot now demolished the site was cleared for the new church and the foundations were commenced. On 6th October the Foundation Stone was solemnly laid at a full masonic ceremony led by Sir Michael Hicks-Beech, the Chancellor of the Exchequer and the Provincial Grand Master of Gloucestershire (). The ceremony commenced at 3pm when two hundred robed freemasons processed from the schoolroom to the site. They were met by the clergy who included the Vicar of Nailsworth and Canon Bowers who was the representative of the Bishop of Gloucester. A hymn and a prayer followed and then the Vicar requested Sir Michael to lay the stone. Sir Michael received vessels of corn and ewers of wine and oil which were placed on a nearby pedestal. A further prayer and hymn followed and then the upper stone was raised and the lower stone adjusted. Sir Michael then addressed the assembled congregation and then he read the inscription on the stone. The Provincial Grand Treasurer placed a phial of coins into the cavity with a copy of the inscription on the stone. The Provincial Grand Secretary placed a plate on the lower stone. Cement was then spread on the upper face of the lower stone and Sir Michael adjusted it with a trowel. The upper stone was lowered with three distinct stops to symbolise the Trinity. Sir Michael tested the stone with a plumb line, supplied by the Junior Grand Warden, a level was then brought by the Senior Grand Warden and then a square supplied by the Deputy Provincial Grand Master. Sir Michael gave the stone three distinct knocks with a mallet and declared the stone duly laid according to ancient custom. Finally the cornucopia containing corn and the ewers of wine and oil were then poured over the stone. Mr Medland was presented to Sir Michael and he showed the Provincial Grand Master his plans. A further hymn was sung and the collection was placed on the stone. When the ceremony drew to its conclusion the Freemasons returned to the schoolroom and a banquet in the Subscription Rooms followed. The walls of the new church gradually took shape and the whole structure was completed within two years. The new church contained five hundred sittings even though part of the nave was used initially as a temporary chancel. The east end was walled up and had small temporary windows which must have meant that the nave would have been much gloomier than it is appears today. The church was furnished with gifts from parishioners and friends. Mr A.E. Smith donated the altar, Mr Medland gave the font and the fine brass lectern was the gift of Mr and Mrs J.S. Davis of Avening. Dr Pratt’s pulpit and the organ, both from the Pepper Pot, were placed in the new building too. Now that the new St George’s Church was completed the consecration was planned for 9th August 1900. In the event the service was postponed as the Ecclesiastical Commissioners had not completed the drawing up of the Deeds. A suggestion had been made that the church should be first opened and then consecrated at a later date. However, on 29th November 1900, St George’s Church was consecrated by Dr Gibson, the Bishop of Gloucester (). The service commenced at 11.15am when the Bishop was received by the Chancellor, Registrar, Churchwardens and clergy. A petition was presented to the Bishop and the procession moved into the building during the recitation of the twenty-fourth psalm. The Bishop, seated at the communion table, was presented with the Deed of Conveyance and this was registered. The church was solemnly dedicated to St George at the Sentence of Consecration was signed by the Bishop and read out by the Chancellor. A Festive Holy Communion Service followed during which Stainer’s ‘Sing a Song of Praise’ was sung. A public luncheon followed in the Subscription Rooms. On 28th March 1901 an Instrument was made by the Ecclesiastical Commissioners, the Bishop of Gloucester and the Vicar of Nailsworth, substituting the new St George’s Church for the Church of All Saints at Shortwood as the Parish Church of Nailsworth. ‘We the said Ecclesiastical Commissioners do hereby transfer all endowments, emoluments and rights belonging to the said old Parish Church (dedicated to All Saints) of the new Parish of Nailsworth or of or belonging to the Vicar of Nailsworth thereof, to the said new Church of St George being by virtue of these presents the Parish Church of the said new Parish of Nailsworth and to the Vicar or Incumbent thereof, and his successors for ever’ (). At the time of the coronation of King Edward VII in 1902, Nailsworth could boast of a consecrated parish church, two chapels-of-ease, two schools, and a resident vicar, assisted by an assistant curate. On Easter Sunday of that year one hunded and twenty people communicated at St George’s, twenty-five at Inchbrook and four at All Saints (1). In 1905 the debt was finally cleared on St George’s, the final figure being £7,119-14-0d for the building work and £300 interest on the debt (2). In April 1903 Mr A.E. Smith had offered a further £500 of his own money if the parish could raise £300 to clear the debt before the 31st October that year. In the event the parish matched his £500. After a fund had been set-up to raise money for a new cemetery at Shortwood the parishioners were then informed that the Nailsworth National School would require the provision of an Infant Department. The County Council insisted on this being accommodated in a separate building and they also required extensive alterations to be carried out to the main schoolroom. Mr Medland was again appointed architect and he estimated that this building work would cost in the region of £900. The new Vicar, Mr Metcalfe, offered the parish the choice of a quick appeal for funds or for the County Council to levy a shilling or one shilling and three pence rate for many years to come. It was decided to launch another appeal. In September 1905 Mr E. Baldwin won the building contract for the new infant department, playground and offices with a tender of £472 and work soon commenced. With the expense of dividing the schoolroom and the provision of a new cloakroom this brought the total cost to about £700. The whole sum was found by April 1908. Fund-raising began all over again when the Vicarage Building Fund was launched during March 1909. It was decided that a proper parsonage should be provided for the incumbent and ‘The Chantry’, the property built by Mr Scott, had fallen vacant and was available for purchase. This house was erected in 1894 on the site of the Great Monthly Market and the design was considered ideal for a parsonage. The purchase price of £2,000 was raised by March 1911 and a further £186 was found to put the house into good order. On the night of 14th July 1909 the Vicarage Fund suffered a loss of one penny which was stolen along with the contents of a bottle of wine. The thief, however, missed half a sovereign which had rolled under the lining of the alms box (3). Problems arose at St George’s in 1912 when the aisle roofs started to leak. The architect, Mr F.W. Waller, proposed re-roofing the aisles in slate but, in the event, it was decided that it would be sufficient to simply alter the angle of the slope. Fund-raising began again during April 1913 with the launch of the Chancel Fund. Sixty pounds had already been contributed but the impetus was lost with the declaration of hostilities during the following year. Back in 1912 Mr G. Horner, the Clerk, resigned after forty years in office and he was succeeded by Mr T. Marshall who served until 1955. During the war years the Vicar, the Reverend F.W. Sears, resigned after seven years in Nailsworth and in 1916 the curate, the Reverend Gerald Bourdillon resigned his position as he was working as a chaplain to the forces. The war years drew to an end and peace was declared which led to the erection of the War Memorial on The Cross. An initial designed that was proposed was for a platform with three cannons and a flagpole (5). A stone Celtic Memorial Cross, designed by F. Bligh Bond, Thomas Falconer and Harold Baker, was provided by public subscription and consecrated by the Bishop of Gloucester on 26th September 1920. The Catholic wayside cross, situated near to the Priory Church, was consecrated on 3rd June 1917 by the Bishop of Clifton and this was one of the very first crosses in the country to be erected as a war memorial (6). During the year 1924 the heating system was installed at St George’s and a boiler room was added to the east of the north porch. Electricity was connected three years later. Shortly after the Great War it was decided to add the chancel as a further war memorial. Since 1901 a temporary chancel had been set up at the east end of the nave and the east end of the north aisle was curtained off as a vestry. The organ and choir, which occupied their present positions, were then seen to be a temporary arrangement too. In 1923 Mr Thomas Falconer, a local architect, was invited to draw up some new plans as the originals, by Medland, were considered too ambitious. Mr Falconer suggested a chancel and sanctuary which would have stretched as far as the school. On the south side he proposed a further porch, near to the site of the present organ, and a Lady Chapel flanking the new chancel. On the north side he proposed a vestry and sacristy with an organ loft above and boiler room below. Mr Falconer also proposed a screen which would have divided the nave from the proposed chancel and this would also have incorporated a stone pulpit. During 1934 Mr Thomas Falconer died and Mr W.E. Ellery-Anderson was appointed to replace him (7). He designed the present Perpendicular-styled Chancel, Lady Chapel and three Vestries. In 1938, after sufficient funds had been raised, Messrs Orchard and Peer were given the building contract and work commenced. The site clearance necessitated the demolition of the Clerk’s Cottage, erected during the 1820s. Phase II of the Church cost approximately £4,200. The work was consecrated on 19th February 1939 by the Bishop of Gloucester. The altar rails were originally situated on the second step of the Sanctuary but were moved during the incumbency of Mr Rodgers to improve the proportions. The vaulting was not coloured until 1965. The piscina was given in memory of Mr. Lemuel Price. Because of the tremendous cost of building, and uncertainty over the strength of the foundations, it was decided to abandon plans for the erection of the tower over the south porch. Mr Clissold’s temporary wooden clock tower was falling into a bad state of repair. The legs, having rotted, were encased in steel girder uprights and the back was built up on concrete. The gas lighting had been replaced by electricity because of the harmful effect on the mechanism and during the 1940s the pendulum fell out damaging one of the clock faces (8). In 1951 it was decided to erect a new clock tower as a memorial to those who had fallen during both wars. The present clock tower was designed by Mr Peter Falconer, the son of Mr Thomas Falconer, and this tower, which incorporates the bells from the Pepper Pot, was completed in 1952 (9). The roll of honour is kept in St George’s Church on the pillar by the south door together with the Royal British Legion colours. In 1950 the schools were re-organized in Nailsworth and the old national school became a co-educational Church of England Primary School. In 1973 376 children were attending the school (10). During 1978, using money released from the sales of the site of Inchbrook Church and the former Inchbrook Infant School, the large vestry of St George’s Church was demolished and replaced by two new parish rooms and a kitchen. The architects were Falconer Partnership and the building work was undertaken by Messrs Orchard and Peer for a cost of about £27,000. Much of the external stonework was reused and the remainder was sourced from the same quarry. The rooms were opened by the Bishop of Gloucester, the Right Reverend John Yates, on 23rd March 1980 who unveiled a plaque. During the twentieth century many gifts were given St George’s Church by both parishioners and friends. Three stained glass windows in the south aisle depict St Luke, St Paul and St Barnabas (and bearing the wheatsheaf mark of Kempe) and were given in 1902 in memory of Henry Pavey, a surgeon, who died in 1893. Three windows depicting St Richard of Chichester, St George and St Martin of 1922, attributed to Walter Tower by David Verey, commemorate Alfred Edward Smith, one of the church’s most generous benefactors, who died on 3rd August 1920. The remaining stained glass window of about 1903 depicts the Prophetess Anna and commemorates Charles Richard Vines of Wanstead, Essex, who died on 2nd January 1884 and his wife Emma who died in Nailsworth. This window bears the craftmark (a greyhound) of Herbert William Bryans. The sanctuary window, which was originally designed to be even bigger and to include the blocked up lower panels, was stained, in 1976, by Peter Strong and shows representations of the symbols of the evangelists. The cost was covered by a legacy from Miss Norman. Other gifts in the sanctuary include the aumbry, which was dedicated on Easter Day 1973, in memory of Miss Clark’s mother, and includes artistic work by Edward Payne of Box and the bracket for the lamp was given by Mr M. Vick. Also we find the Bishop’s Chair which was given in memory of Sidney Arthur Townsend, the blind organist at St George’s from 1922 to 1958. The statue of Our Lady in the Lady Chapel was given by the Reverend Robert Miller in 1974. Other gifts in the church include the crucifix above the pulpit which was given by the Mothers’ Union in memory of the Reverend Peter Walker who died in office in 1970; the statue of St Michael, cast from an original by Mother Maribel of Wantage, was given in memory of Kathleen Price (1910-1952) and the limewood statue of St Francis of Assisi, given in memory of Miss Mary Clark of the Upper House, Spring Hill, both in the children’s corner. The sanctuary is flanked by a banner for the Mothers’ Union which was presented by Mrs King of Egypt Mill and one of St George and the dragon. In the Parish Room there are two tapestries of Cossack Square and the Clock Tower made and given by Miss Harris of Fewster Road. Mrs L. Taylor of Spring Hill made the long animal tapestry for the children’s corner. The mural on the west wall of the church was painted by Sir Oliver Heywood during 1985 and reminds those who gaze upon it that the risen Lord continues to bless them and the whole community as they go about their daily activities. Drawings of Nailsworth scenes around the painting develop this theme reminding us that all the ages of man and all human emotions within the common experience of life in work and leisure are pervaded by Christ’s gracious presence. During 2008 a huge painting of The Last Supper was commissioned by the Parochial Church Council to hang behind the altar at St. George’s. The canvas was painted by Lorna May Wadsworth, a young portrait and landscape artist. The painting resulted from a bequest from Alan Denman who left the Church £5,000. Painting started in October 2008 and the finished work was placed in the church in time for the unveiling and dedication on St George’s Day 2009. Born 1872 at Kentisbeare, Devon; Educated Sherborne School; Admitted Pembroke College, Cambridge 1890; B.A. 1893; M.A. 1898; Wells Theological College 1894; Deacon 1895; Priest 1896; Curate of St Luke, Gloucester, 1895-1902; Curate of Dursley 1902-1904; Nailsworth; Incumbent of Ottery St Mary 1908-1920; Incumbent of St Luke and St Michael, Torquay 1920-1926; Westcott, Surrey; Vicar of Stoke Canon, Devon 1833-1936. Born 1875 Otham, Kent; Queen’s College, Cambridge; B.A. 1897; Hon C.F. 1919; Deacon 1899; Priest 1900 London; Curate of St Paul, Bunhill Row, London, 1899-1901; Curate of Holy Trinity, New Town, Bishop’s Stortford 1901-1903; Curate of Coleford 1904-1909; Curate of St Paul, Gloucester (in-charge of Tuffley) 1909-1917; T.C.F. 1914-1916; Vicarof Lower Cam 1917-1922; Nailsworth; Incumbent of Bisley 1835-1947; Rural Dean of Bisley 1943-1947; Died 1949. During the late 1830s Mr. J.C. Tabram of Bannut Tree House drastically restored the ancient chapel in his grounds and also compiled a manuscript book detailing what he had discovered about the chapel and the work he, himself, had carried out there. . One would imagine that Bannut Tree Cottage would still retain many features which would reveal much of its mediaeval past. Sadly the building has been used for secular purposes for far longer than it was ever a place-of-worship. The author of the article entitled “Nailsworth Old Chapel and Priest’s House, Bannut Tree House”, published in the Borough Guide sometime between 1905 and 1908, stated that the former chapel had been converted into a stable ‘rather more than a hundred years ago’. This work probably took place between 1786 and 1794, between Bigland’s description of the building being in a ruinous state and Fosebrooke’s description of it as a stable. At this time the roof was probably restored and a floor inserted which made the upper part usable as a hay-loft. The stonework above the west doorway indicates that an opening was inserted at first floor level perhaps for labourers to get the hay into the loft. In 1831 the occupant of Bannut Tree House was James Norton. However, by 1836 the property was in the occupation of Mr. John C. Tabram. Tabram was an intelligent man, a collector of antiquities and curiosities. Clearly he took an interest in the history of the former chapel and he decided to put it to a more sympathetic use. At that time two other buildings were being demolished – Horsley Parish Church and Fonthill Abbey in Wiltshire. The first church was built in Horsley by 1105 and dedicated to St Martin. This became in time the parish church for an area which included Upper Nailsworth. By 1332 the chancel of the church had been built or re-built and the nave and aisles were already complete. During the fifteenth century a four storey tower was added as well as the north and south chapels. The chapel to the north of the chancel was dedicated to St George and may well have contained a chantry. In 1839, during the incumbency of the Reverend Samuel Lloyd, the whole church, with the exception of the tower, was rebuilt – for this new structure to be erected the mediaeval church was swept away. In March 1840 it was reported that he had given annually more than half of the proceeds that he received from the small living of Horsley and also subscribed towards the re-building. However, he had paid £200 more to contractors and was hoping to be re-imbursed by well-wishers. Later he was to raise the initial funds towards the building of the church at Selsley. Fonthill Abbey was a very different building. It originated as a ruined folly, erected in the 1790s by William Beckford to the designs of Wyatt. The ruin was supposed to be a convent, complete with chapel, parlour, dormitory and part of a cloister. In 1807 Beckford decided to make the Abbey his home but permanent residence required the erection of a 275 feet octagonal tower, a 120 feet hall and two wings which measured 400 feet in length. The ruin had turned into a Gothic fantasy. However, in reality its proportions were ludicrous and its detail poor – ‘Georgian bodies dressed up in Plantagenent clothes’. One night in 1825 the tower collapsed because of inadequate foundations and after further demolition work only fragments now remain. ‘Of the Chapel – Rudder says that there was formerly a chapel at Nailsworth and another at Aston. Fosebrooke says Oct 19th 1794 a new Episcopal Chapel (nearly upon the site of an old one long ago converted into a stable) of which gives no account was opened (error see Rudder & Biglands histories). This latter is situated at the Bannut Tree Cottage in the parish of Avening – the property of George Blackwell Esq and was used many years as a stable, a part of which is now converted into an office. There was an ancient Gothic stone window frame in the East End, the upper part of which has been removed to the …………… end appropriated for an office and filled with painted glass principally from Fonthill Abbey, also an ancient stone font or Piscina with the bottom hollowed out to serve as a basin for holding the holy water and a hole in the centre which lets the water run into a stone receiver. This curious relic has been much damaged while in the stable but has since been cleaned and removed to the end of the building Westward. Several relics of antiquity have also been found on the premises, a silver penny of Edward 1st in 1253. Also a small metal image of a female supposed to represent the Virgin Mary and a piece of a Roman pan or dish similar to that which has been discovered with the testelated pavement at Woodchester May 15th 1834. In May 1838 the entire of the old chapel was opened for an office for Savings Bank etc. The lower window in the East end was brought from Horsley Church and was made for the Vestry in the year 1802. The other also came from the said Church and is supposed to be 800 years old. It was in the old Chapel of the Church called St George’s, the glass is all from Fonthill Abbey (marginal note – a Gothic Folly built 1813? ), the other window the glass principally from the latter place. The coat of arms of the family of the Revd Samuel Lloyd from Wheatenhurst the family late of that manor. On the 16th of May 1839 was erected a seat in the garden an old window and other relics from Horsley Church. The seats are oak made from the celebrated pole erected to perpetuate the general peace of 1814…’ (see previously). The office gradually became a private museum as the years passed by and its owner, Mr G.B. Tabram, gradually filled it with an assortment of curiosities including the bell from Kynley Priory, numerous books, a collection of arrow heads, butterflies and stuffed birds. Pieces of Jacobean carving were displayed and the window jambs were decorated with shells and ladybirds. During the 1890s Miss Ellen Tabram and her sister, Mary, ran a school in the house but by 1915 Arthur Twisten Playne was able to report that the office was ‘now closed and well taken care of’. During the Second World War soldiers were billeted in the old chapel and after the death of Mrs Ellen Tabram the property passed to her sister, Mrs Thomas Hay. The Hays were retired teachers and enthusiastic botanists and they remained owners of Bannut Tree House until the 1950s. The former chapel once again became a dwelling house in 1973 when a new kitchen wing was added and a dormer window installed in the roof – a structure which still retains its cruck roof-truss. Three services are known to have taken place in the building during the nineteenth century. Tabram records in his manuscript book that on 10th May 1841 the Reverend Henry Paddon preached a sermon there from the text John 2: 10 and the same clergyman preached there again on 15th June in that year. On 23rd June the Reverend John Betts conducted a baptism in the former chapel. There have never been any serious plans to restore the building as a place-of-worship although the Reverend C. D. G. Rodgers, Vicar of Nailsworth, was apparently keen on the idea. This entry was posted on April 28, 2016 by Richard Barton in Church History and tagged Anglican, Bannut Tree House Chapel, Church of England, Gloucestershire, Local History, M. H. Medland, Nailsworth, Pavey Smith, Pepper Pot, Peter Falconer, St George's Nailsworth.